UNITED NATIONS, November 27 -- As the issue of global warming has gained more and more currency within the UN system, the UN Development Program has jockeyed for position. This is reflected in the theme of this year's UNDP Human Development Report, "Fighting Climate Change." 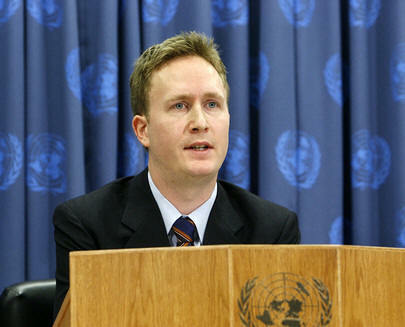 Tuesday at UN Headquarters, UNDP's Claes Johansson took questions about the report. Inner City Press asked for UNDP's response to criticism from UN environmental expert R.K. Pachauri, that the report is "questionable," and by India, that it is "misconceived." Johansson said that UNDP "welcomes the debate." But who, Inner City Press asked, does UNDP speak for? Apparently not even for itself: Johansson called the HDR, for which UNDP claims so much credit, an "independent" report. For the record, it is copyrighted to UNDP. If development is uniquely the mandate of UNDP -- often, UNDP says it cannot champion or even respect human rights because they might be inconsistent with development -- why this striking shift into the climate change debate, generally the province of other specialized UN bodies? Johansson said that if global warming is not dealt with, there can be no development. Many, but not UNDP, would say the same of human rights, or of transparency, including in procurement. 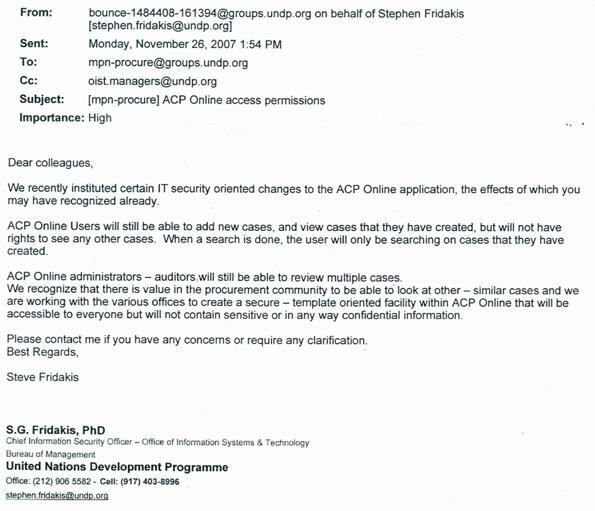 While UNDP launches its "independent" report, internal UNDP watchers noted it was limiting access to its procurement database -- click here for the (leaked) memo -- concerned about leaks like Inner City Press' recent reporting on UNDP having paid for Tony Blair's ten rooms in Jerusalem. Further secrecy will never be the answer. At an earlier briefing, under embargo at the time, UNDP's Olav Kjorven said that UNDP "gives advice" to countries to not, for example, engage in destructive palm oil projects. He acknowledged that there are bad projects. But what does UNDP do about them? When Inner City Press asked for UNDP's response to the call, by Al Gore and others, for a moratorium on the construction of new coal-fired power plants, until clean technology actually exists, Kjorven declined to give a UNDP view, saying it is a "political issue to be negotiated." It would see the percentage by which emissions should be reduced is also political, and is certainly "to be negotiated" -- but that did not stop UNDP from wading in. Where's the consistency? Here's something in which UNDP is consistent: not reporting the average income in North Korea, and not including North Korea since 2001 in the comparisons in its Human Development Index. North Korea is off of UNDP's map -- and the U.S. and Canada are off UNIFEM's map.